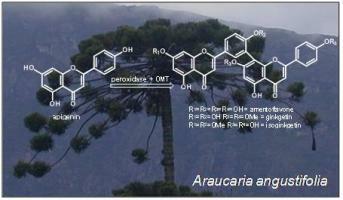 Araucaria angustifolia is an endemic conifer and main component of the “Mata de Araucarias”, an endangered bioma in southern and southeastern Brazil. Their needles contain several amentoflavone-type (C8” – C3’) biflavones, which differ from each other in number and position of methoxyl groups. Neverthless, no data was available on biflavonoid biosynthesis regarding the precursor or enzymatic nature for the dimerization step. Thus, the flavone apigenin was determined as the precursor of amentoflavone, ginkgetin and isoginkgetin using an enzymatic preparation from A. angustifolia needles as determined by HPLC/ESI/MS analyses. Studies on the diurnal and seasonal changes on biflavonoid biosynthesis were carried out revealing an incredible high conversion peak at 9 h (PM) while in case of seasonal variation the biosynthesis of biflavonoids was detected in October during the spring season of the Southern Hemisphere. Additionally, the effects of pH, H2O2 concentration and incubation time on enzyme activity were also studied. The optimal conversions were determined at pH 7.0 and H2O2 concentration of 100 ?M reaching maximum conversion in 24 h of incubation. The seasonal enzymatic changes was also monitored in Ginkgo biloba and the biflavonoid biosynthesis was showed to occur one month after leaf emergence but it reached the highest activity during the summer.